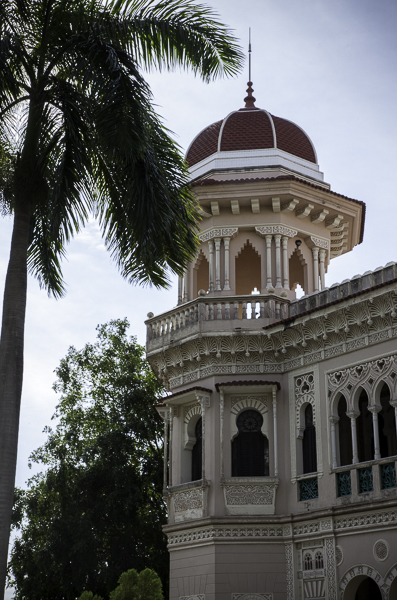 Our first stop after entering Cuba at the Cienfuegos Airport was the Palacio de Valle. Built in the early 20th century as a private residence for a sugar merchant, the Palacio de Valle currently houses a restaurant next to the Hotel Jagua. 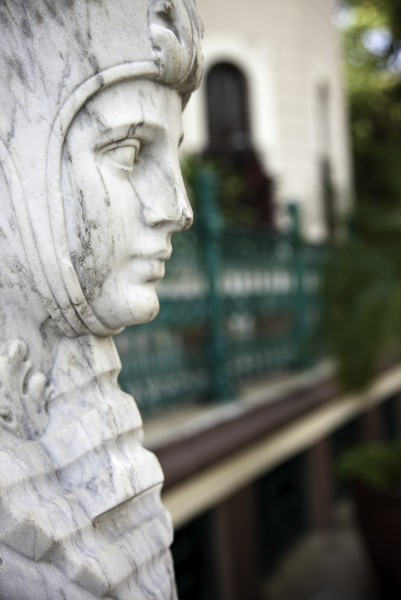 The eclectic architecture incorporates Moorish, Venetian, and Beaux Arts forms. Three towers across the front, in three different designs, represent power, religion, and love. 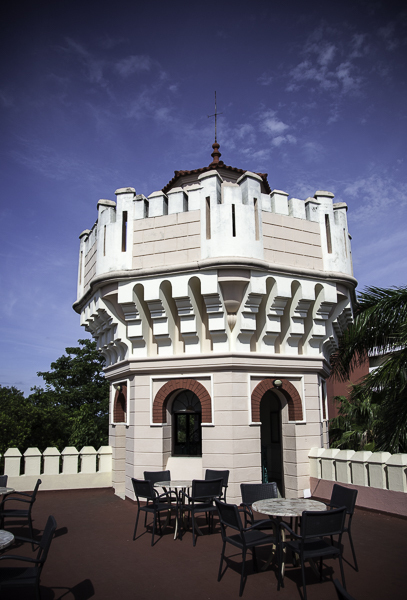 In the 1950s, the Palacio de Valle was purchased by the developer of the Hotel Jagua. The intention was for the Palacio to house a casino. But, then, the Revolution happened. Hotel Jagua opened as the first post-revolution hotel in Cuba, but the casino portion of the plan was halted. 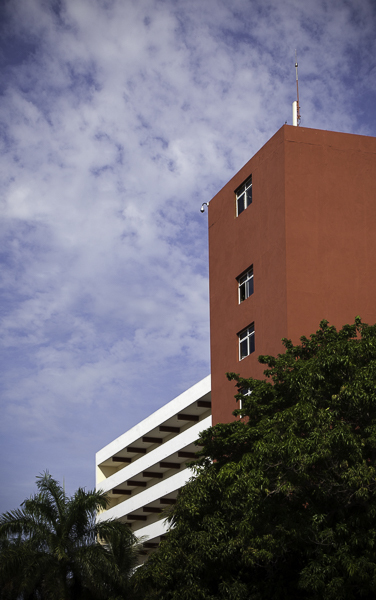 Rick took this photo of Hotel Jagua, with its mid-century modern architecture. The Palacio de Valle shares a parking lot with Hotel Jagua and its restaurant is convenient to hotel guests. Do you want more of Cuba? I wrote up some observations from my trip to include with my book review of Cuban Revelations by Marc Frank. And, I shared my first photos of the trip last Saturday. 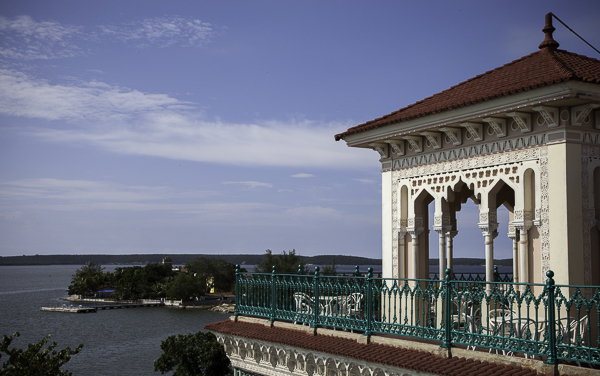 Next Saturday, I’ll post photos of our explorations in downtown Cienfuegos. Check out West Metro Mommy Reads today for more Saturday Snapshots. Gorgeous photos! 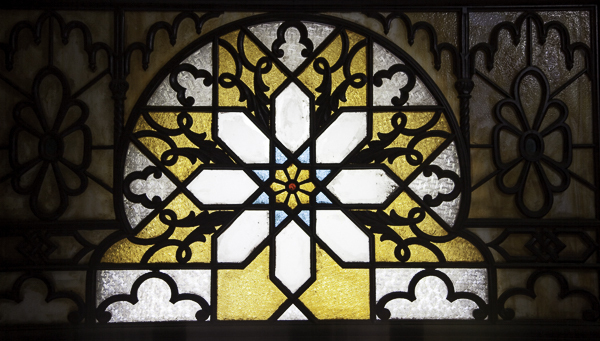 I really enjoyed the stained glass and the tiles….thanks for sharing. The stained glass and tiles are great quilt block inspiration. The towers were very interesting too. Thanks for sharing your travel photos. Beautiful photos of a lovely place. 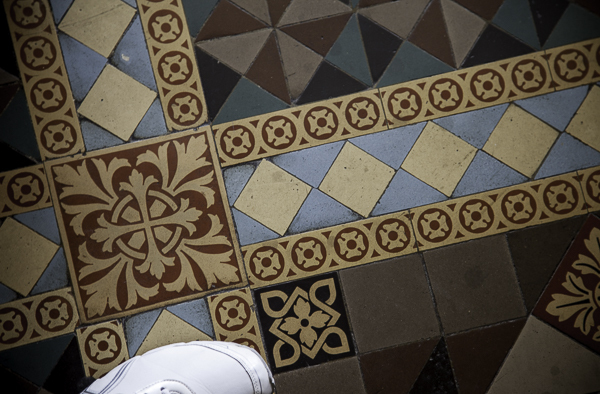 I especially like the stained glass windows and floor tiles. Wow! Beautiful! I hope there are pictures of food coming up in the next few weeks of Cuba. How pretty. I’m loving the photos of Cuba. Great shots. It looks like a lovely place to visit. Many Canadians go there in the winter.